You are here: Home / Jewelry / Brooches / Colorful carved nephrite floral brooches. Colorful carved nephrite floral brooches. I don’t know if you know this about me, but I’ve gotten really into potted plants. I started out with one, and then when it seemed like I was successfully keeping it alive, I bought another. And then another. That was about a year ago; now I have 11 all in a row on my living room windowsill. I’ve only lost one of them (RIP, cilantro). I love having them in my home. There’s nothing like the color and feel of a living plant. That said: these brooches come close. They both use carved nephrite as one of the main materials, and my goodness, it’s beautiful. Isn’t that just a marvelous riot of color? 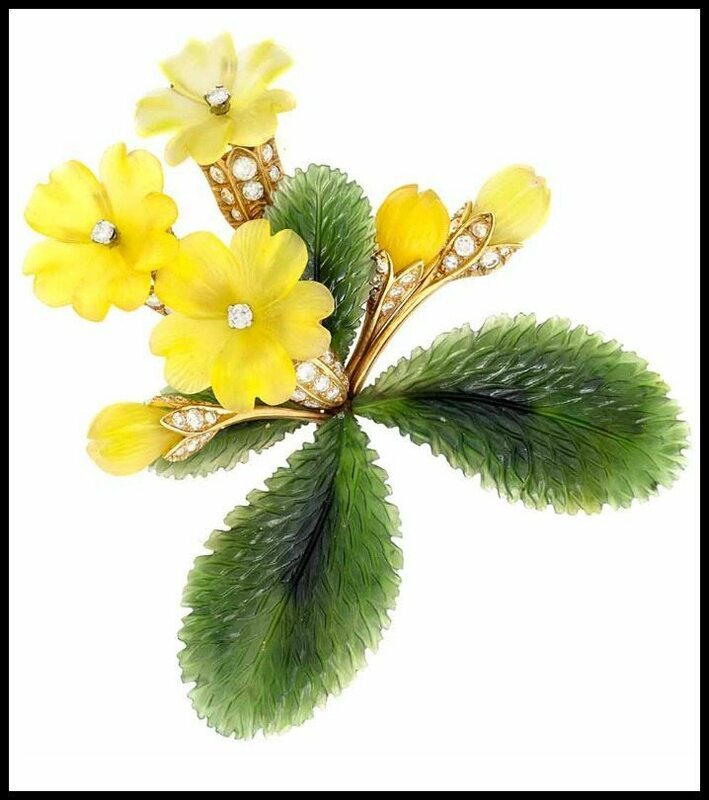 This piece features golden stems set with 1.50 carats of round and single-cut diamonds diamonds, blooming flowers and buds carved from yellow crystal, and leaves of intricately carved nephrite leaves. I’m not sure if this is supposed to be a particular kind of flower: what do you think? This brooch, on the other hand, is definitely supposed to be a specific kind of flower: Lily of the Valley, to be precise. It’s also a signed piece by Zadora. This one has a much more delicate feel, a contrast to the bold, cheerful statement that the one above makes. Isn’t it lovely? 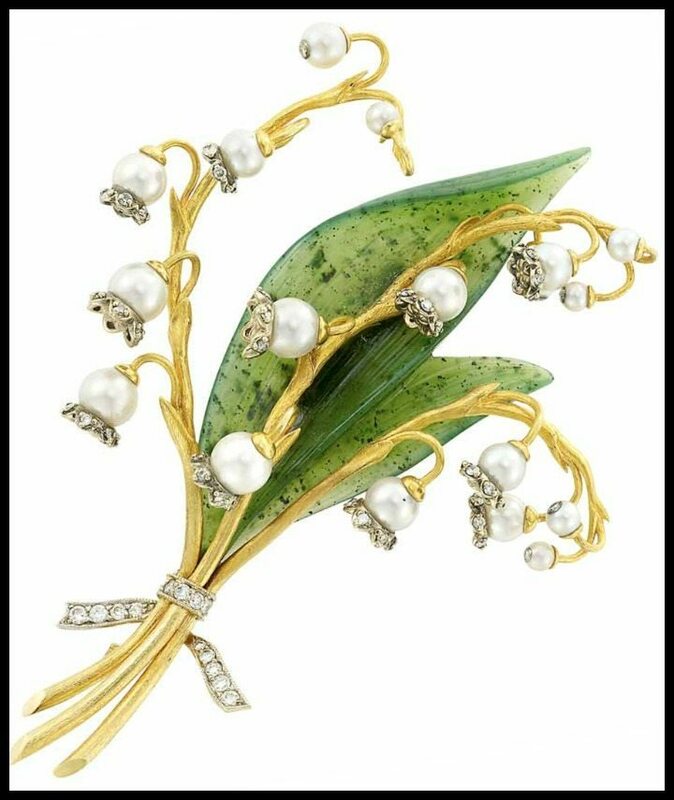 Just look at the carefully wrought golden stems, the little pearl blossoms dripping with diamonds, the gentle curve of the carved nephrite leaves. The diamond-studded ribbon, carefully tied around the bottom of the stems, is a wonderful touch as well. While the rich color and careful carving of the nephrite in the brooch above made it remarkable, what I love about the nephrite in this piece is the dark inclusions. I think the imperfection makes the leaves more beautiful and the piece as a whole more interesting than it would be otherwise. These brooches were both listed in a recent Doyle New York Auction; please see the individual descriptions above for source links. All images and info are thanks to Doyle New York. i <3 <3 <3 these!! I thought the top were primroses based on the flower structure and leaves, but really, they're likely to just be something pretty. Aha – good flower detective work! I think you may be right.